Mechanical BullDog Rental Atlanta and surrounding area, including all the Southeastern US. Our new Mechanical Bulldog is a must have! This extremely unique attachment offers all of the fun and safety features as our Bulls, including a soft head and auto-stop feature. Choose from either the All-American round inflatable, or the Barn Yard themed inflatable!! 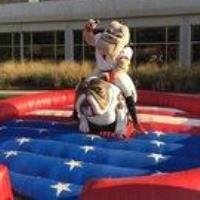 A Mechanical Bulldog ride is always a great time for your guests, and it’s now easier than ever to provide a totally unique attraction at your next event. There are only a couple of these in the World, but we have one! Contact Laser Sporting today for details on how to bring Bart the Mechanical Bulldog to your next party, festival or event. Why should you partner with Laser Sporting for your Mechanical Bulldog rental? The only Mechanical Bulldog in Atlanta (or the Southeast). A professional, experienced staff focused on maximizing fun while maintaining safety. Add Bart the Bulldog to your next event. 2 hour rental, extra hours $150 each.